According to the historical text “Shoku Nihongi,” which was compiled during the Heian Period (794~1185), the province of Mimasaka-no-Kuni was formed in the sixth year of the Wado Period (713), when the six districts of Aida, Katsuda, Tomata, Kume, Oba and Majima split off from the northern part of Bizen Province. 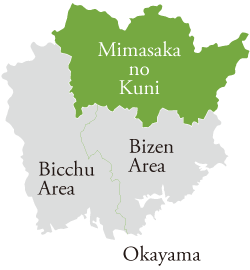 These six districts covered essentially the same land as the ten modern-day cities, towns and villages that now make up northern Okayama Prefecture (Tsuyama City, Maniwa City, Mimasaka City, Shinjo Village, Kagamino Town, Sho’o Town, Nagi Town, Nishiawakura Village, Kumenan Town and Misaki Town). This museum displays many priceless treasures, including a portrait of Bodhidharma by Musashi himself and one of his tsuba (sword handguard) with a distinctive “catfish and gourd” design. The surrounding area is full of famous spots and ruins of places with a connection to Miyamoto Musashi. This museum houses a collection of paintings by artists such as Kinichiro Fukushima and manuscripts and other materials of such literary figures as Ki Kimura and the playwright Roppuku Nukada. This museum displays materials related to notable scholars of Dutch learning who were either from or had some connection to Tsuyama, including Genzui Udagawa and Genpo Mitsukuri. This museum features displays that introduce Tsuyama history and culture across seven different themes. Its collection also includes “Edo Hitomezu Byobu,” a rare folding screen birds-eye view of Edo. This wooden Renaissance-style school building was built in Meiji 40 (1907). The building interior is open for tours. The school has become famous as a filming location for movies. This post station along the Inaba Kaido Highway was home to the still extant Ohara Inn, which was used by the Lords of Tottori Domain when they passed through on their way to and from Edo under the sankin kotai (alternate attendance) system, wherein feudal lords were required to divide their time between their home domains and the capital of Edo. The gates of honor and palaces built in the “sukiya” (tea ceremony house) style still look exactly as they did back in the day. Part of the Shimoyama Inn, where the Lords of Tsuyama Domain once stayed, remains intact to this day. Located along the old highway, the former Katsuda District Office has now become a symbol of the town. With its lattice doors and Namako walls, this historic townscape preservation district retains the charming atmosphere of the castle towns of old. Many of the historic buildings allow visitors inside, including the Sakushu Joto Mansion, the former home of the noted scholar of Dutch learning Genpo Mitsukuri and the Joto Mukashi Machiya (old townhouse). This area is full of shrines and temples, including Hongenji Temple, the family temple of the feudal lords of Tsuyama Domain, the Mori Clan. At the same time, the area also retains vestiges of its heyday in the Taisho Period (1912-1926), when it prospered as a residential area for merchants and artisans. This stretch of town along the ancient Izumo Kaido Highway features rows of old shops and houses featuring distinctive white walls, Namako walls and lattice grids. One of the great pleasures of Katsuyama is enjoying a stroll while viewing the unique and creative shop curtains hanging from the eaves of each building. Sitting before the treacherous Shiju Magari (40 Turn) Pass—considered the most difficult stretch of the Izumo Kaido Highway—Shinjo was once a major post station full of inns for feudal lords and their attendants. It is also famous for “Gaisenzakura,” its rows of cherry trees that bloom every spring along a stretch of the ancient highway. The site of the former Kichigahara Station has been transformed into a park and museum that recreates the look and feel of Yanahara Mine and the surrounding mining town as it appeared in the 1950s. The actual Kichigahara Station building has been preserved exactly as it was in its heyday. Featuring various displays such as the second largest fan-shaped train garage in all of Japan and thirteen rare train cars, including a D51 steam locomotive (known affectionately as “Degoichi”), Tsuyama Railroad Educational Museum serves to educate about the history and mechanisms of railroads. With its wooden windowpanes and ticket gates, this invaluable train station building vividly retains the appearance of a small, rural station in pre-war Japan. This still operational station was used as a location for the filming of “Tora-san to the Rescue,” a film in the beloved “Otoko wa Tsurai yo (Tora-san)” series. This station retains the vestiges of its time as a reversing station for snowplow trains coming from Tottori. It was here that these trains were turned around and supplied with water. Today, the station is an invaluable Heritage of Industrial Modernization Site. Take your time and enjoy the slow journey between Tsuyama and Chizu. The highlights of your trip will include viewing retro train stations and the warm welcome the trains receive at each station.